After pickup at select locations in San Francisco, settle into your comfortable party bus or party limo, depending on the size of your tour group, and dig into a breakfast spread of croissants, bagels, cream cheese and fresh fruit accompanied by a mimosa (sparkling wine and orange juice). During the drive, you'll be entertained by your informative driver-guide, who points out sites of interest en route to wine country. At the northern end of the Golden Gate Bridge, stop at Vista Point for a panoramic view of Alcatraz, Angel Island, the San Francisco city skyline and the bay. 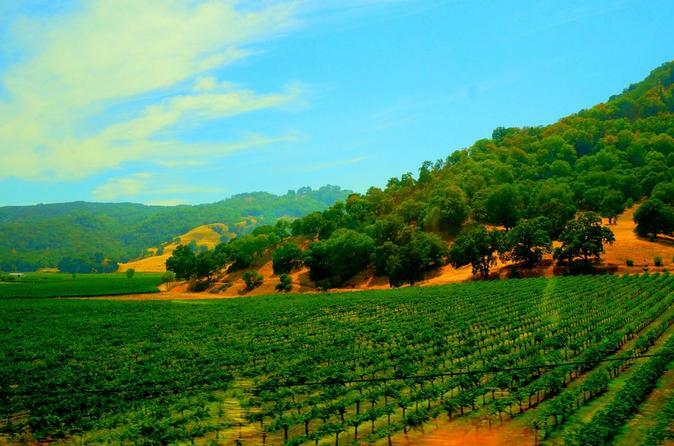 Then it’s onward to four Sonoma County and Napa County wineries that represent a cross-section of tastes to please any palate. Additional wineries may include Hagafen Cellars in Napa, Roche Winery or Cline Cellars in Sonoma, or a tasting room on Sonoma Plaza. You'll also make a stop at the Olive Press, an award-winning producer of olive oil. Taste traditional varietals as well as oils infused with herbs and fruits. About halfway through the day, sit down to a winery picnic lunch. You'll also visit CornerStone Sonoma, a relaxing spot that's home to boutiques, wine rooms, food shops and gallery-style gardens designed by landscape architects. Your 8.5-hour day trip ends with return to select San Francisco drop-off points.